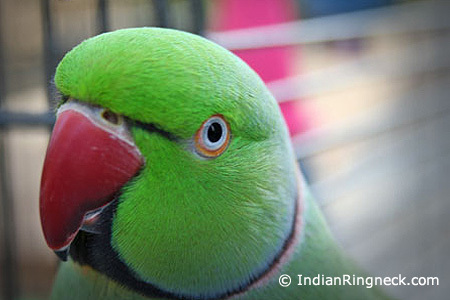 Bringing home an Indian Ringneck is exciting and there are some pitfalls that can be avoided to ensure your parrot does not become stressed during this transition. Like most parrots, ringnecks are sensitive to stressful situations and being placed into a new environment is no exception. If proper research is done a new ringneck should adjust into its new environment smoothly. This will intern set the tone for a long and happy life with you. When your ringneck has been purchased and brought into your house for the first time you might have the temptation to hold him and introduce him to your family. Though this is common, there are certain things you should take into consideration before you let your new ringneck out. The first important thing to observe is the parrot’s health. A healthy ringneck will react to human interaction in some way. 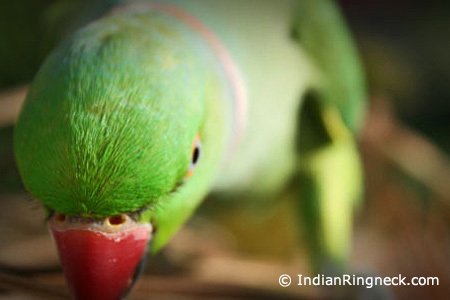 For example, an untamed ringneck might shows signs of fear, while a hand-tamed ringneck will gladly step on your finger. A parrot that sits with ruffled feathers, a runny nose, watery eyes, and discharge from the vent should see a veterinarian immediately. If other birds are present inside the house, your new ringneck should not be introduced into the same room until he has undergone some type of quarantine. It is also important to observe the temperament of your ringneck before any handling can begin. At this time it is usually good to take into consideration his upbringing, weaning, and socialization history. A properly handfed ringneck will most likely enjoy some sort of human interaction. His curiosity should be elevated and usually he should have no regard to who is handling him or any environmental changes. If your bird is playful and confident from the beginning, then it would be acceptable to handle him upon his arrival. If your ringneck acts erratic and thrashes around his cage in the presence of humans or pets—most likely he was not handfed, was aviary raised, or is scared. This is a clear and obvious warning that your ringneck needs time to adjust and has not been tamed. The best thing to do in this situation would be to give the ringneck a few days to adjust before any handling can begin. 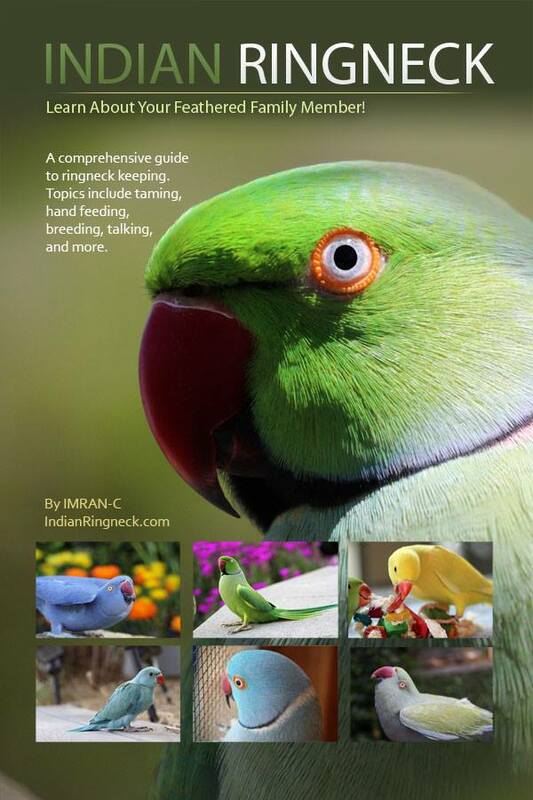 Knowing your ringneck’s temperament will help eliminate a stressful situation. Before any handling is done ensure your ringneck’s wings are clipped. Many new parrot owners do not realize the state of their bird’s wings until the bird is startled and flies away. If your ringneck can fly, having his wings clipped will reduce a disastrous situation. There is noting more depressing then a lost bird because the wings were not clipped. If your ringneck is scared it is important handling is kept to a minimum. A stressed ringneck can easily bite and hurt itself in an effort to escape a tramatic situation. When transferring the ringneck to its cage make sure to inspect the wings before the transfer is done. A scared ringneck that does not have its wings clipped can easily fly into a window or mirror and kill itself—take caution. If the ringneck will not move from one cage to another, gently take a small towel and wrap it around the bird and move it form one cage (carrier) to another. Ensure to use gentile movements and a calm voice to reasure the bird and to make sure it is not frightened. Knowing your ringneck has a clean bill of health is important if you’re going to introduce him into your home or aviary. An ill bird could potentially transfer diseases or parasites to your established flocks if left unchecked. Unfortunately, many breeders have made the mistake of not practicing a healthy quarantine and have learned the hard way. An outbreak can quickly spread to healthy birds if not checked. Always make sure to take all new ringnecks to the vet to ensure your new bird is in optimal condition. Most breeders will offer some sort of guarantee or vet certificate upon the purchase of your bird. Ruling out any diseases is a key factor to ensure you have a happy and healthy pet that can safely be integrated into your household. Again, if you have other parrots, the new ringneck should be placed in a different room away from your established parrots to avoid any air born diseases. Always wash your hands between sessions when interacting with your established birds and new birds. Finally, always change the new ringneck’s cage last after you have cleaned your original birds first. This one-way interaction will reduce the chance of spreading disease from one cage to the other. If the ringneck is not tamed the cage should be placed in a location where it is quiet and there are no loud noises. Having a quiet place to relax and get acquainted with his surroundings is ideal for your new ringneck. This is especially important if your ringneck has not been hand fed and finds coping with change to be difficult. If a ringneck is forced into a stressful situation he could quickly become ill or exhibit nervous behavior. A worried ringneck will not eat and could thrash around his cage if placed in an uncomfortable area. If possible, the cage should be placed at eye level to create a sense of confidence in your bird. Ringnecks were designed to stay high in the trees so placing the cage in a higher location will give the parrot added security. During the time the bird is adjusting to its surroundings, it would be a good idea to keep children, pets, and excessive noises out. The cage should not be placed in a window without some sort of covering or shelter. The sun can quickly overheat your parrot or a slight draft can cause the parrot to become ill. Finding a balance between the sunlight and a properly dressed window that provides shade is ideal. Once the ringneck has been moved over to its new cage take the time to observe your new ringneck. During this observation period make sure your ringneck is eating and drinking regularly. Placing a few extra food and water bowls inside the cage is a good idea. During this time, most ringnecks will not touch their food until their owner leaves the room. You’ll know when the ringneck eats by examining his seeds. You want to look for cracked husks. If you can’t tell then gently blow on the seeds and husks will fly off the top layer off seeds. Another important thing to examine is your parrot’s stools. If they are runny then this is a good sign your ringneck has diarrhea and still needs more time to adjust to its environment. If your parrot has not made any effort to pass food then he is not eating enough–more space should be given to the ringneck. For any reason if you believe your ringneck is ill do not hesitate to contact an avian vet. Some ringnecks find human interaction terrifying and difficult–especially if you have an untamed ringneck. Knowing a few tricks to help your new ringneck get used to your presence can go a long way when trying to get the bird accustomed to you. Avoiding eye contact is essential as this intimidates them. Because ringnecks are hunted animals, they are very perceptive to our body language–this means making slow movements and speaking in a soothing voice to help calm your ringneck. When walking into the room of the cage, whistle before you enter to alert the bird. This will help the bird understand you are not making an effort to hide your presence and prepare the bird for your entrance. These are just some basic guidelines and tips. Please feel free to visit our forum for more creative ideas.